During a recent interview with HipTV, Ace comedian Atunyota Alleluya Akporobomerere AKA Ali Baba discussed the sad rate at which the education standard in Nigeria has deteriorated, especially for the female children. He also explained that the first lady of Nigeria is unable to speak English articulately because she lacks basic education; which is the primary and secondary school education. “The education of the girl child is very important because if Patience Jonathan were educated, we will not have the problem that people think we have with her not being able to speak English”. He went on to say – “Having a primary and secondary education helps a child to develop (into) whatever the child wants to become later. 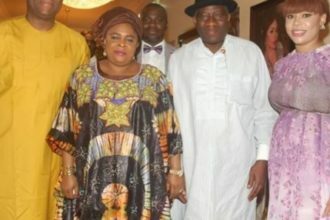 It is obvious that Patience (Jonathan) did not get any of the above, or did not get it properly”.